This time around, we got a mini crib for the nursery. Snickerdoodle's old crib was just too big for the room so we sold it on Craigslist and picked up a nice little white one. 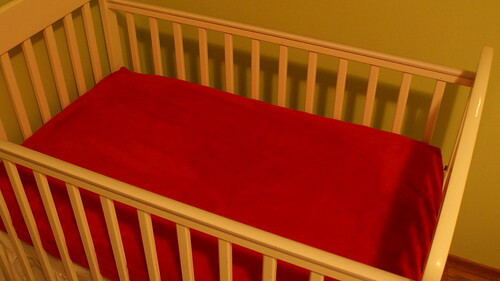 I love it but it turns out the crib sheets aren't so easy to find, especially at an affordable price and in fun colors and fabrics. I figured I could make one myself and sure enough, it was so easy that I cranked out two of them in an evening. 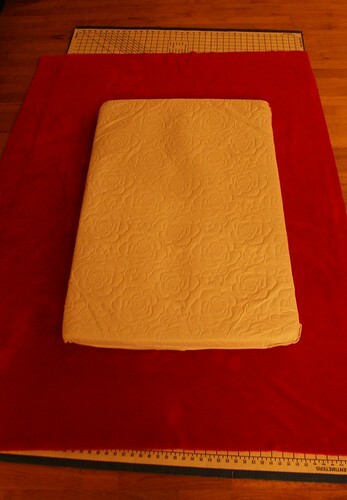 If you're doing a mini crib fitted sheet, you'll need about 1 1/4 yards of 60 inch wide fabric per fitted sheet. I purchased a fabric called "Ultra Cuddle" from JoAnn Fabrics. This stuff runs $10.99 per yard but JoAnn always puts out coupons in the Sunday paper or through their mailing list so I actually used a 50% off coupon. 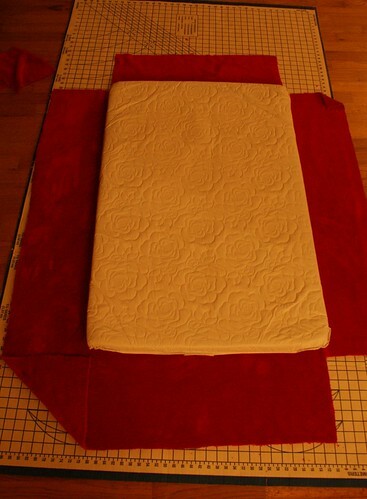 Lay out your fabric on a cutting mat or other flat surface and place the mattress in the center. In this tutorial, I used the thinner mattress that came with our mini crib because it was handy but the fitted sheet also fits on the 3 inch thick mattress we purchased separately. Trim down the sides so that they're of even width. I knew I'd need at least 6 inches to accommodate a 3 inch deep crib mattress (3 inches to cover the edges plus 3 more inches to wrap around under the mattress). Now cut out a square from each corner. To get this right, you might want to fold the corner down then cut along the edge. 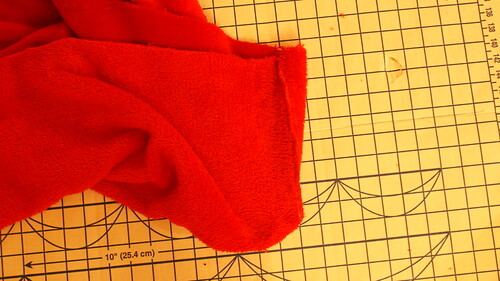 If your fabric has no stretch to it, make sure you leave yourself a seam allowance (don't fold it in as far as I did). 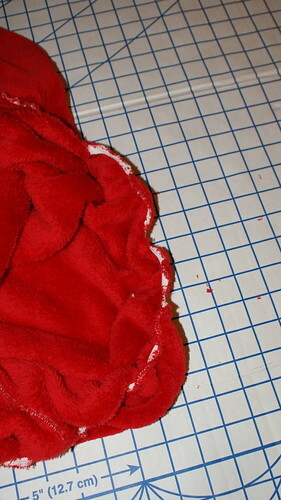 Now take your fabric off to the sewing machine and sew the seams making sure to pin right sides together. 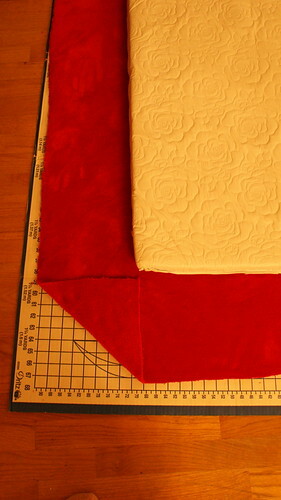 You'll be sewing together the 2 sides of each square to create corners. The last step is to add elastic all around the raw edge to pull the sides in tight under the mattress. I used elastic that was 1/4 inch wide and combined 2 steps into 1. I really needed to seal off the edges of this fabric because it sheds EVERYWHERE!! So, while I ran it through my serger, I lined up my elastic with the edge and pulled it as hard as I could while letting the fabric feed through the serger without stretching. This sealed off the edges, attached the elastic and gathered the fabric in one sweep. It doesn't look fantastic but it is under the mattress so I didn't mind that. If you're more concerned about the look, you can fold in the raw edge and create a casing then thread elastic through that casing and pull it tight but make sure you don't pull it so tight that you can't stretch the sheet over the mattress. Also, if you don't have a serger, you could use my technique with a zig-zag stitch on a standard sewing machine. Now test it out and stand back to admire your work. Just think, a similar sheet would have run me $35-$40 for such a great fabric (the closest I can find online is the Minky stuff) and I spent less than $10. Imagine the possibilities with vintage sheets too. great, I love this color. I agree that the color is amazing, I saw a similar on think baby site but was more bright.